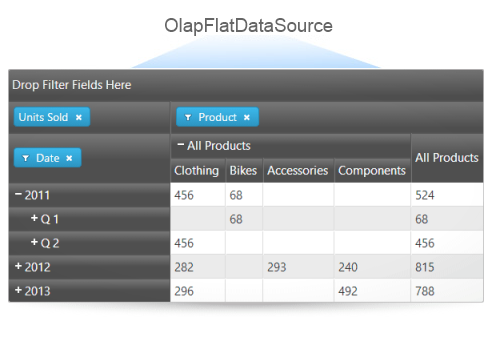 The igOlapFlatDataSource component enables multi-dimensional (OLAP-like) analysis to be performed on flat data collections. Given a data collection or an igDataSource™ instance and based on the user configuration, it extracts the necessary metadata in order to create dimensions of hierarchies and measures. The igOlapFlatDataSource component also performs calculations and aggregates data as requested using the component’s API directly or through one or more of the Ignite UI widgets capable of visualizing and interacting with OLAP data, e.g. igPivotView™ or igPivotGrid™. Optional="true" Specifies any valid data source accepted by $.ig.DataSource, or an instance of an $.ig.DataSource itself. Optional="true" Explicitly set data source type (such as "json"). Please refer to the documentation of $.ig.DataSource and its type property. Optional="true" Specifies a remote URL accepted by $.ig.DataSource in order to request data from it. Optional="true" Specifies the name of the property in which data records are held if the response is wrapped. True if the data source has been initialized, otherwise false.